During an early May visit to Gills Onions, OnionBusiness.com’s Sherise Jones met with company owner Steve Gill and later given a tour of the impressive Oxnard, CA, facility by Plant Manager Carson Ludwig. 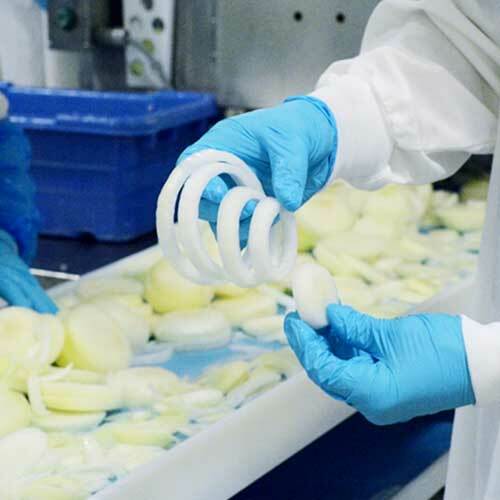 Gill explained that the operation is geared largely toward foodservice, although the operation does sell fresh onions to a number of customers and also provides clamshell packaging for retail. To meet the needs of its diverse customer base, Gills tailors its marketing and promotion efforts to individual clients, always keeping an eye to the changing demographics and consumer demands. In that respect, Gills Onions knows firsthand the market impact of the Millennial generation, individuals born between 1987 and 2000. Theirs habits and the trends they are establishing are changing the food industry landscape, and the industry consensus is that Millennials have become a powerful force in their own right. Steve Gill commented that the younger generation is becoming the backbone of fresh produce sales – and is contributing to the downfall of the “center of the store” philosophy in retail. Innovation is the way to reach Millennials, and Gills Onions has been at the forefront of that wave for decades. Today’s Gills Onions is the result of two brothers’ innovative thinking in the early 1980s. It was then that Steve and his brother David, who were at the helm of an onion farming operation, were asked by a salsa manufacturer if they could supply diced onions for the condiment. The upshot of that challenge is a vertically integrated fresh-cut processing plant in Oxnard. Proprietary equipment peels, slices and dices, and today Gills Onions are integral ingredients in salsas and sauces as well as in restaurant dishes. And, as noted, they are found at retail. The value-added Gills Onions are exactly what appeals to the Millennial generation, Steve said. He said today’s processed onions from Gills are geared for the Millennial “wheel-house,” and he said they fill the demand at retail and foodservice for convenience. Also reducing the need for labor, Gills proprietary processing is part of a sustainability program that Millennials and look for when they buy. At the processing facility, the Gill brothers rely on the expertise of Plant Manager Ludwig. Steve said Ludwig came to Gills Onions with experience in the meat industry, which brings a strong food safety background in requirements and regulations. Under Ludwig’s management, Gills has implemented what is considered the highest level of food safety: The facility itself is state-of-the-art, with food handling segregation procedures and a sophisticated facility-cleaning program in place. All has been designed to ensure quality at every level. The company participates in multiple trade shows, and Steve said for Gills Onions, PMA Foodservice is the best venue. The expo is great for meeting customers, he said, but the days surrounding the event are some of the most productive because it provides opportunity to meet customers and strengthen relationships in person. Steve also mentioned that Southeast Produce Council is a very important show for the company, and Gills Onions also sends representatives to United Fresh to walk the show and meet with customers. Gills Onions’ sales focus is based on U.S. customers, Steve said, and the operation exports to Canada as well, engaging in promotions to cultivate business with our northern neighbor.